Join us Saturday, June 22, 2019 at Maize Valley Winery & Craft Brewery in Hartville, OH for the 7th annual 1st Lt. Ashley White Freedom 5K. This race is a cross country (XC) run through the fields and vineyards of Maize Valley Winery & Craft Brewery and Moore's Tree Farm. Day of registration begins at 6:00a.m. Opening remarks/ceremony and National Anthem will begin at 7:30a.m. Race will start promptly at 8:00a.m. Register here before June 12th to be guaranteed a t-shirt. T-shirts will be limited on race day and are at a first come first serve basis. 1st Lt. Ashley White-Stumpf was killed during combat operations in Kandahar Province, Afghanistan on October 22, 2011 when the assault force she was supporting triggered an improvised explosive device. Ashley was assigned to the 230th Brigade Support Battalion, 30th Heavy Brigade Combat Team, North Carolina National Guard, Goldsboro, NC and served as a member of a Cultural Support Team attached to a Joint Special Operations Task Force in Afghanistan. Ashley grew up in Marlboro, OH and attended Marlington High School. 75% of proceeds will go towards a scholarship fund at Marlington and 25% will go towards Hero Dogs. Donations can also be given by going to this link fundraiser page, donations can also be made through the registration process. 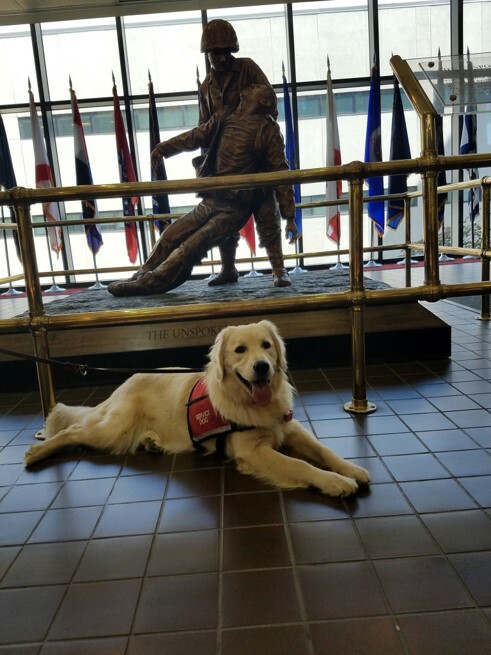 Hero Dogs Ashley has been named after 1st Lt. Ashley White and will be at the race this year! Check us out on our website www.hero-dogs.org! Check us out on Facebook! Price for 5K Run/Walk will increase in 2 months. In consideration of the foregoing, I, for myself, my heirs, executors, administrators, personal representatives, successors and assigns, waive and release any and all rights, claims and courses of action I have or may have against EnMotive, Ohio Challenge Series, Running Away, LLC and its affiliates, their agents, employees, officers, directors, successors and assigns and any and all sponsors, their representatives and successors, that may arise as a result of my participation in the 1st. Lt Ashley White Freedom 5K and any pre- and post- event activities. I attest and verify that I am physically fit and have sufficiently trained for the completion of this event and my physical condition has been verified by a licensed medical doctor. Further, I hereby grant full permission to any and all of the foregoing to use any photographs, motion pictures, recordings, or any other record of this event for any legitimate purpose including commercial advertising, without monetary payment to me.